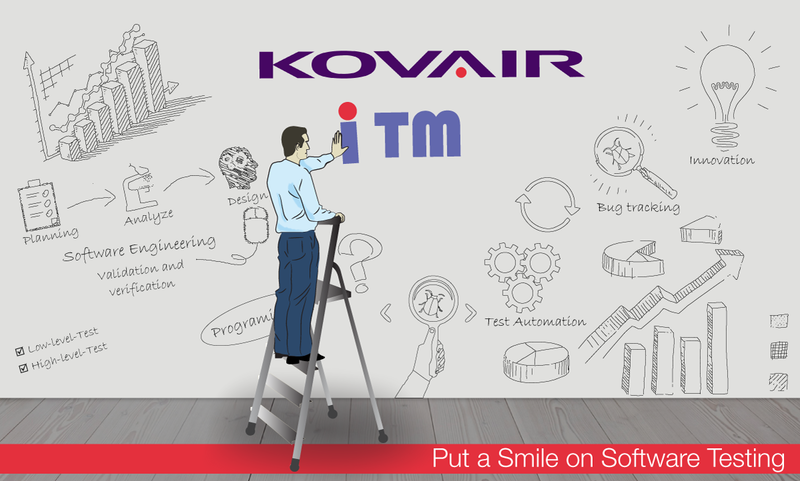 Kovair’s integrated test management software – iTM allows QA and development teams to track every aspect of software quality by providing support for manual and automated testing, automated defect tracking and real-time monitoring of key test metrics and KPIs. The integrated testing platform helps organizations to achieve Continuous Integration - CI and Continuous Delivery – CD, thus fulfilling the needs for DevOps adoption. Kovair Software, one of the leaders in Integrated Application Lifecycle Management (ALM) domain, announces the launch of its enterprise-class software test management product – Kovair iTM – a one stop solution for performing manual and automated testing in conjunction with other tools and development phases across Application Lifecycle stages. 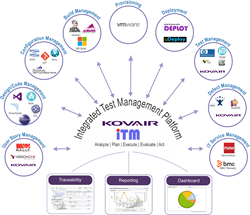 Kovair’s Integrated Test Management - iTM framework is equipped with multi-tool integration capabilities through the Kovair Omnibus, which supports Continuous Integration, automated triggering of builds, provisioning, test automation and real-time reports and metrics, ensuring Continuous Delivery and rapid deployment practices – the road map to DevOps. “Today, the software industry is adopting continuous development and testing in production, continuous deployment using automated processes which are repeatable and reliable and continuous monitoring of quality and feedback mechanisms at every stage. Kovair iTM has been configured to meet all these requirements of the state-of-the-art processes,” said Bipin Shah, CEO and Chairman of Kovair in a recent interview conducted by Michael Lippis from Outlook series. “In the world of agility, everybody talks about testing not being a mere phase anymore but an integral part of the lifecycle right from the beginning. For really achieving this, organizations need a central integrated test management tool along with a strategy and capabilities of extending its support for CI & CD,” said Amit Dasgupta, Director – Product Management and Marketing at Kovair. Watch a short video demonstrating how Kovair iTM solution helps organizations face various productivity challenges and ensures delivery quality at a lower cost. To learn how Kovair iTM caters to all the advanced testing needs, please contact Kovair QA experts. Kovair Software is a Silicon Valley software product company specializing in the domain of Integrated Application Lifecycle Management (ALM) solutions and supports global software development and management. Kovair’s focus on integrating third-party best-of-breed ALM tools enables development of applications in a synchronized tools environment. Kovair’s flagship products Omnibus Integration Platform, ALM Studio, Integrated Test Management – iTM and QuickSync are highly preferred solutions by some of the major corporations globally. To learn more, contact sales@kovair.com.